D.C craft: Anything that can filter runes, if possible use crafts that can heal hp. R1:Spend at least 2 turns here so the fusion partner can do a 20k snipe on the explosive egg next round. And make sure you don't make any enchanted darka, beware in column spinning. R2.Use all actives EXCEPT fusion, save that for later. Still need to watch out for enchanted dark. R3.Column spin for da win! R4.No need to hesitate killing the dark egg first. If Madam Chyan's buff is gone for some reason, turn it back on. Once the shield is gone fusion for full heal and column spin! R6:Column spin for da win! Before killing it, use craft to prepare all five attributes for Boss. R7.If you have prepared your runes via craft, then use Midgley, Namtar and Madam(if she's usable). Column spin should do the trick! Else, Endor. Remember to use Mu Yue/Vega to heal if you got hit! R1-R5: Kill everything! Don't get hit! R6: Store CD here, kill off the minions and reserve the boss for stalling. Repeat until all actives are up. R7.Use Giemsa's LD=Water active when you have too much LD runes around. Use craft if necessary. R8.Kill her as fast as possible. Again, use craft if necessary, if available. R9. Get hit once,heal up and kill her, make sure you're at full health though when she's invisible, then spin away! R10b.Urd freeze and use your damage boosters when you have all five attributes on your board. R1-R3: If you die here I recommend you to pray...RNGesus. R4:Aim at the earth one first if you Medusa still ain't ready yet. Then Medusa them and kill. R6.Stall actives! Nothing special here. R7. Spend the first two turns spin with all you might, then Medusa it and kill. R9. Stinger to reveal it then normal spin. R10a. Barbara-Byakhee skill and craft. R10b. Medusa stun and use all actives when your board has five attributes. Grind before stage 3. until yog sot up. use it for 2 form of stage 3. Stage 7: deactivate all princess and use yog sot skill. it is enough damage without support to kill the evolve material. Stage 8: depends on confident level. use main char for counter 2 sec spin. If you spin good. the card is replaceable. Stage 8 second form: can be used to active all skill back. killing it off with craft to convert enchanted stone. 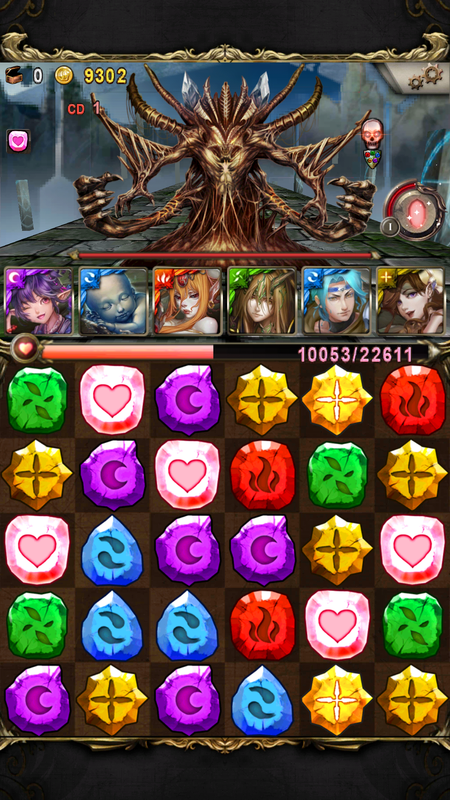 Stage 9: with princess on, the damage is enough to kill both stage. Diablo overheal will get you killed on stage 2. Can't use Isabelle either. The options I can see are: Marguerite, Dual Lucy with enough HP, Komatsuhime teams . 2) Light Marguerite and target Yvette. The diffusion should kill the cocoon and you can safely move on. 3 -7) The rest you can grind through using Margarite, Hamel, Morris for hearts. I was intending to use Diablo team skill on the boss but failed to spin but thanks to these 3 being max skill I could grind through. On round 1, spin 3 combos including 1 dark to leave just 1 mob alive. Stall as long as possible. After that, turn on Novalis when ready and just kill everything with Masamune. Wawel once near the beginning to heal up, and then once again after you get hit on round 9. Just grind through. Haza to help on rounds 4, 7, and full heal after you get hit on round 9. Medusa to help kill diablo form 2. 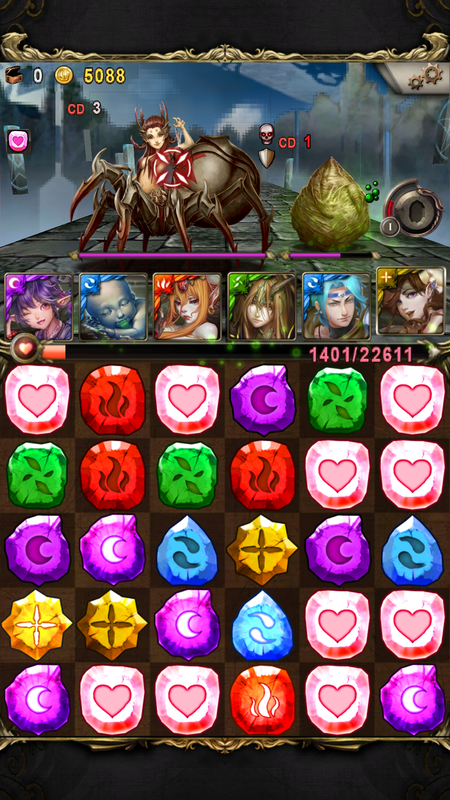 Tiny, earth elf that explodes doing 30x earth dmg can help you on the 2nd stage if you want a mono elf team with sniper. It was from Monster strike seal. Magrence's active could work too, just target Yvette while doing a single attack spin. Oni the snake conjurer "first damage received will not lead to your defeat" should leave you at 1hp. cleared Ultimate with following team, thought the achievements was Leader/Ally are Elves, 5 attr. 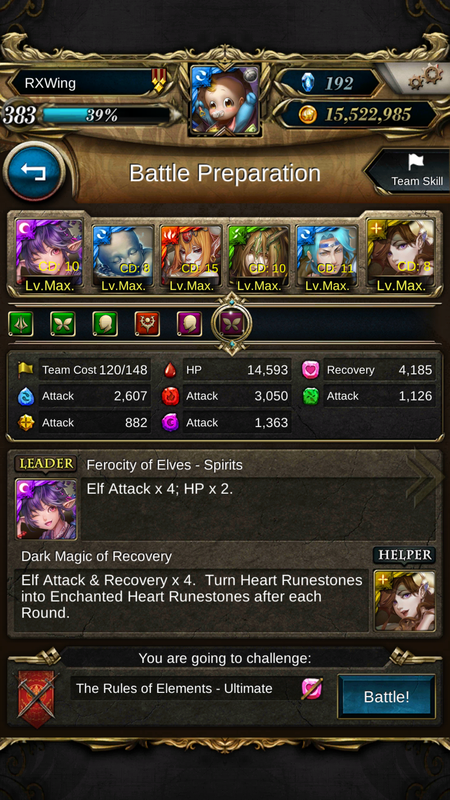 A quick heads up, as rxwing also mentioned, they changed the achievement for the ultimate stage from Leader+Ally Elf to Mono Elf. Cleared all Achievements using a number of different teams. Stage 1: Burst with Matryoshka + Merlin. Stage 2: Activate Marguerite and target Yvette so the Egg doesn't explode. Afterwards, burst with Diablo-Isabel combo skill. Stage 3: Burst with Matryoshka + Merlin. Stage 4: Burst the Egg down with Margarite. Activate Isabel at CD1, then activate Diablo-Marguerite combo skill. Try to manage the damage so that you can kill her at CD1 with the skull up, thus grinding for CDs. Stage 5: Kill at CD1 for grinding CDs. Stage 6: Burst the Egg down with Matryoshka + Merlin. Grind for Diablo-Elf combo skill and Merlin to come off CD. Use Margarite, Matryoshka or DC to stay alive. Stage 7: Burst with Diablo-Elf combo skill + Merlin. Note that Margarite is the Water Elf from Monster Strike, while Marguerite is the TOS original that spreads damage around for three turns. Activating Jabbanero at Stage 2 to disable the Egg. Turning off Medea and making sure you have enough HP to tank Isabel at Stage 4. Activating Yog at Stage 7 against Diablo if you're missing an element. Stage 10.1: Remember the colour of Earth when using the Beast team and Dark when using the Dragon and Dark teams. It's an old stage, so for the most part you're just spinning through everything. 3) Target trojan first and kill within 2 turns. Should be back to full HP after this. 7) DC to burst down when you have 5 attributes. Ultimate 1* Clear (Human Team) with KOF team featuring Mai. I brought Aggressive Suspire Amulet as DC, intending to 2* (no active skills) but brought the wrong charging crafts. If I had DC then I wouldn't have needed to use Mai to heal at Isabelle. This was a bad idea because it's so slow. Rose is a better team. Burst down stages 4 and 7. Ultimate 1 Turn Clear because why not? For 6* Achievements you can basically just spin through everything since it's such an old stage and YZ is OP.